The Hosts are from Sheffield. They are five smartly-attired gentlemen from the North and they have been smoldering away in the musical margins, waiting in their waistcoats for their moment to shine. Signing to Fierce Panda Records, they announce the release of their debut album Softly, Softly on CD and digitally on Monday 10 February 2014, with their single September Song following a week later. It is one of two tracks on the album recorded by local compatriot, Richard Hawley. The Hosts consist of Tom Hogg (vocals, guitar), Jim Fisher (keyboards), Jamie Shipley (guitar), David Glover (bass) and Adam Crofts (drums). Earlier in 2013, the quintet tickled the underbelly of the mainstream beast with September Song (a self release) and Give Your Love To Her (on Label Fandango), two raffish slabs of retro alternative pop which represented the missing link between Roy Orbison and Richard Hawley and which waltzed all over BBC 6 Music and Radio 2. September Song – itself reissued as a Fierce Panda single on 17 February – and Give Your Love To Her appear on Softly, Softly, alongside another eight slabs of melody-powered melancholy. Fittingly, a couple of these songs – tracks one and two – were actually produced by local compatriot Hawley while another of them is a version of The Big O’s In Dreams. In The Hosts’ world no chorus can be big enough. No sentiment can be bitter sweet enough. No emotion can be a deep enough shade of blue. All of which befits a band whose wall-of-soundscape has been known to take in Buddy Holly, Phil Spector, The Velvet Underground, The Beach Boys and Jonathan Fire*Eater. 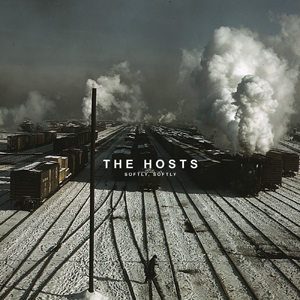 The Hosts make quite the perfect live guests too: they’ve toured with Paul Weller, The Walkmen and Cold War Kids and played their broken hearts out with Mr Hawley, Cherry Ghost and other such sombre cats. Because out of that darkness and out of those shadows comes light and so it is that The Hosts are preparing for the launch of Softly, Softly. Track one Would You Be Blue allows this record to snap straight into action. The song resembles a romantic Christmas number with its dramatic melodies and passionate lyrics, “When I said I’d be true/When I said only you/Why on Earth would you be blue?” It’s a retro pop song full of dramatic beats, chiming bells and rhythms you can click your fingers to which, when added together, creates an atmospheric 1950s Rock ‘n’ Roll feel. September Song feels like a Green Day song when it starts (that’s if Green Day were an alternative retro pop band). The vocals are very Billie Joe Armstrong sounding and rightly so, seeing as Billie Joe and Norah Jones released a tribute album to the Everly Brothers last November. The One is a very 1950s Rock ‘n’ Roll inspired track with clear influences from Roy Orbison being heard in this track. The verse, “Remember all the suitors in your dreams/It’s funny how they all looked just like me/You were holding out for something that can’t be/Do you remember?/How you danced away that starry, starry night/Hoping for those feelings you can’t fight/I told you in the end you would be mine/Do you remember?” is very sweetly written and sung. It tugs at the heart and allows you to go a little bit teary eyed. The chorus then helps to emphasise the love that inspired this song even more, “I’ll be the one who will know you/The one who will hold you/The one you will run to/In the night/I’ll be the one who will love you/This time I will show you/The one who will make you remember”. Add these gooey lyrics to the swayable, finger clicking melodies and you have the perfect pop love song. In Dreams starts with deeper vocals and the simple strum of a guitar before those 50s inspired rhythms set in. You can’t help but enjoy The Hosts’ music – it’s catchy, loving, affectionate, fun, emotional and tuneful. The Hosts won’t fail to get your feet moving, your head bobbing and your body swaying in time to their delightful melodies. In Dreams instantly sounds vintage – it’s a classic, love-me-do pop song. With You is quite a sad number on Softly, Softly compared to the other tracks which, although some may be sad in terms of subject, generally have happy or uplifting sounding melodies. With You is a lot darker and more sinister with the lyrics, “As I lay here in fields of snow I’ll wait my turn when the whistle blows/I’ll climb to the stars/But I’m cold/I’m so cold/These tears travel dry as my mind flashes by/When I sit at home one winters night/And see the kids and watch them fight/Those moments pass so slow/With you/With you…” illustrating the love loss and heartache felt. It’s a really deep song that won’t fail to get your eyes welling up with tears. The Hosts produce brilliant, vintage pop which is refreshing to hear. There’s none of the cheesy boy band rubbish – they are taking pop back to how it used to be known; The Monkees, Buddy Holly, Roy Orbison. They are taking pop back to something to be proud of, not embarrassed by. Softly, Softly is an explosion of drama, emotion, swinging pop melodies and wonderfully silky vocals. It’s an album to get in 2014. Softly, Softly will be released on February 10 through Fierce Panda Records.